The city to our west has more energy than any artistic movement in the region. And the institutions are beginning to take notice. Here's what Dallas can learn. That energy has moved west. Fort Worth is experiencing a creative boom led by DIY spaces like fwblackhouse, Art Tooth, Latino Hustle, Art Luck, and Mañanaland. In a city where the motto is “Cowboys and Culture,” many long made the argument that it thinks more about the former and less about the latter, despite Fort Worth having arguably the best museum district in North Texas. That’s changed from the ground up. Take Labor Day of 2017. I was with Art Tooth co-founder Dee Lara, Latino Hustle co-founder Raul Rodriguez, and fwblackhouse founders Noel and Sara Viramontes at the Boiled Owl, a dive bar on Magnolia Avenue. They discussed their dreams for the city of Fort Worth, about being artists and culture creators of color. They noted that Fort Worth hasn’t traditionally embraced folks who look like them. But their tone was defiant, not defeated. They weren’t going to wait for any institution or gallery to recognize their work and their talent. Nor were they going to leave to make their names in other cities. They were going to create their own movements, institutions, audiences, and communities, and they were going do it in their hometown. Fort Works Art, directed by artist and curator Lauren Childs, exhibits many of the new wave of Fort Worth artists—Jay Wilkinson, Jessica McClendon, Fabiola Valenzuela, Hillary Dohoney, and others. It is hard to find a local artist who hasn’t participated in a group show of some kind at her space. A lack of contemporary gallery spaces is probably the biggest deficit in Fort Worth’s art scene. Yet it also has led to the reign and invention of its best collective and alternative spaces. Organizations like Art Tooth (which is currently being led by Aimee Cardoso, Shasta Haubrich, and Ariel Davis) have had shows in spaces like Shipping and Receiving, The Collective Brewing Project, and the Fort Worth Community Arts Center. They have also collaborated with Modern Art Museum of Fort Worth, where they’ve held a Meet Me at the Modern series to diversify and appeal to younger audiences for the museum. Perhaps their most successful invention is their Gallery Night Party Bus, which invites folks to gallery hop on a bus, meet fellow art enthusiasts, and attend an afterparty at fwblackhouse. If there is one thing Dallas could immediately steal from Fort Worth, it would be having a party bus on our big opening nights. Art Tooth, fwblackhouse, and Fort Works Art aren’t the only hubs of the burgeoning art scene here. The social practice project Mañanaland, led by artist and curator Michelle Kirk, could become the Funkytown version of Oliver Francis Gallery (OFG)—an exhibition space, studio, and gathering place for some of the city’s most ambitious creatives. Their most recent show, “I’d rather be with you,” is a group effort featuring Jeremy Joel, Alexa Alarcon, Jana Renee, Michael Cocanower. It felt like an important marker for the scene. Alarcon made a series of sculptures, paintings, and installations that processed a recent divorce. It ingeniously made the viewer shift between perspectives of domestic and interior spaces, moments of discovery and isolation. They were ambitious, lovely works and paired well with Joel’s wooden installation, which seemed to grow out of the very house itself. It felt like something you would expect to see in a museum, not in an industrial DIY room. Whether it is Renee working through paintings of fourth-wave feminism or Cocanower’s massive light installations, it is hard not to feel like you are in the future. On the first weekend of 2019, artists put together the Twelfth Night party. It was hosted by Atlee Phillips, whose day job is the director of Texas Art at Heritage Auctions. There is an intergenerational nature to the Fort Worth art scene socially that can sometimes be missing in Dallas; one is as likely to run into an artist who has been working for a few decades (Gwen Merhag) as you are into a younger video artist (Madie Braswell). At an afterparty at the home of Fort Worth collector Whitney More—whose mother, Martha Hyder, was the force behind the Van Cliburn piano competition—I ran into Holland Sanders of the HOLLAND Collective. Sanders is responsible for much of the communication strategy behind many artists and cultural businesses in Fort Worth. She formerly worked in communications and marketing at the Fort Worth Opera. There is a sense of smallness and camaraderie in the current art scene. In a few years, everyone might be too busy and specialized for this type of social leisure, but part of what gives a scene energy is that enough folks are creating art together, drinking and eating together, and partying together. All of that togetherness organically creates its own identity. One of the most admirable artists in Fort Worth right now is Arnoldo Hurtado. Hurtado is a painter, performance, and social practice artist who is currently helming the most impactful social practice project in North Texas, called Communidad 27. Many people talk about art as social change, but Hurtado is the rare person who puts it into action. He works in his home neighborhood of the Northside, a historically Latino community that has been marked by poverty and crime. 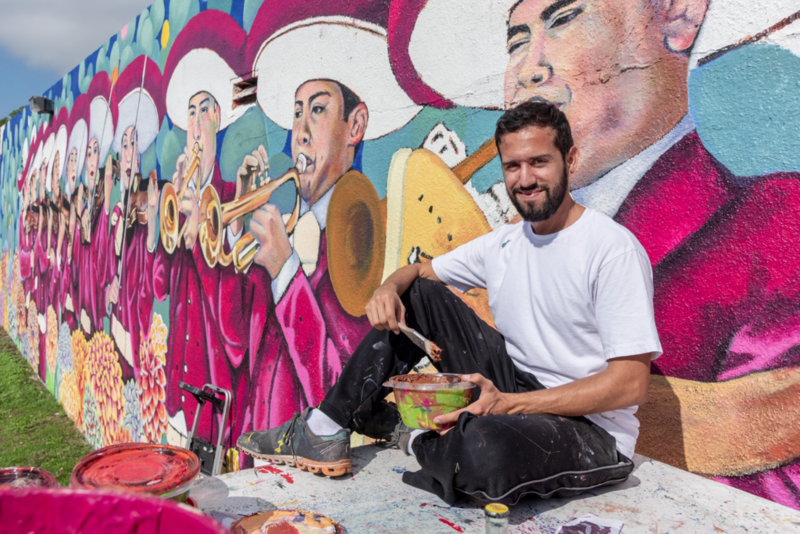 Hurtado has used arts and culture to instill new vibrancy and hope into the community. He led a team of artists to paint a huge mural on the side of Franko’s Market grocery store and successfully lobbied the city of Fort Worth to plant trees alongside a nearby median. He teaches his community about issues like zoning and displacement through his “Horchata Nights” series and is the creator and administrator of the Northside Community Facebook group, which has more than 3,700 members. On the opening of Hurtado’s community mural, I spoke to fellow Northside-born artist Raul Rodriguez about the project. He said he had never seen the community come together like this. Rodriguez, a photographer, knows a thing or two himself about community. He is a co-founder of Latino Hustle, alongside Jessika Guillen and Gerardo Contreras. Latino Hustle has curated shows and markets that highlight the often-overlooked contributions of Latino culture in Fort Worth. 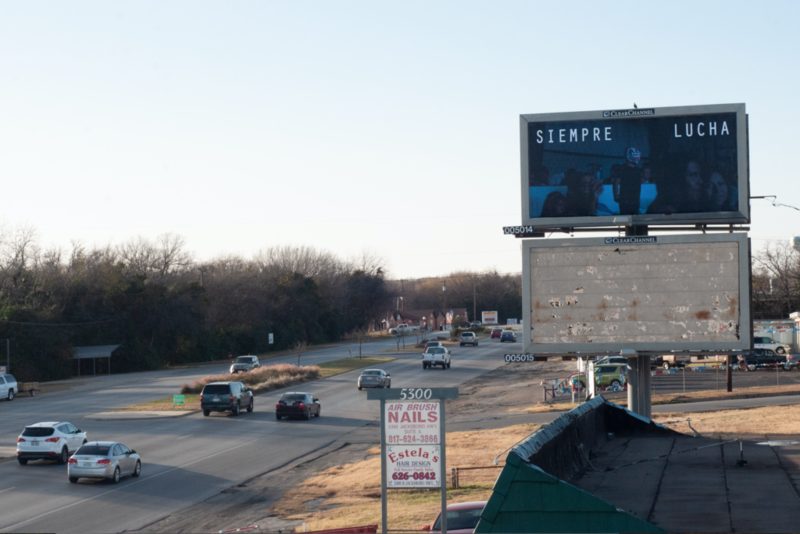 Rodriguez recently partnered with the Modern to create a billboard that is installed in the Northside that features one of his photographs of a young boy in a luchador mask and the words “Siempre Lucha”—always fight or struggle. The Modern might have been the first major arts institution to support this new crop of Fort Worth artists, but the other institutions are taking note and following suit. The Kimbell Art Museum has increased its outreach efforts to incorporate local artists in its educational programming. The Amon Carter just announced a new Community Artists program, which Hurtado was selected to be a part of. Hopefully, the city of Fort Worth will put some of its own dollars behind the Fort Worth creative scene by providing grants to individual artists for community projects. This practice is common in Texas cities like Dallas, Austin, San Antonio, and Houston. Arts savvy City Councilwoman Ann Zadeh, whose district includes the Cultural District and the Magnolia area, is already looking for ways the city and businesses can continue to support Fort Worth artists. Having lived through—and been part of—the most recent Dallas boom, I can attest to energy being a tricky thing. There is a fire kindling in the city of Fort Worth, yet it is remains incredibly fragile. Without enough support, energy, attention, funding, and investment, it could quickly go out. As the artists who are currently in Fort Worth have more opportunity to prove themselves, they will become more attractive to other creative scenes with greater infrastructures to support them. It is hard for a burgeoning art scene to hold on to its best talent; hopefully Fort Worth will realize its great fortune and do everything in its power to retain its creative class. Its universities—especially TCU—could do more to get involved in fostering this renaissance. There is also plenty of room for the entrepreneurial class—who are already individually supportive of local artists in Fort Worth—to become collectively supportive. Just think: if some of the next generation of Fort Worth business owners banded together, they could easily raise close to a million dollars a year in grants for Fort Worth artists. Attracting artists from other cities will be necessary as well. There is something to be said for creative density, after all. This goes hand in hand with exporting artists from Fort Worth to other places, which Visit Fort Worth is already doing in the area of music (and is another thing on the list Dallas should immediately steal from Fort Worth). Needless to say, there is a lot of work to do. There always is. Yet, the future is unbelievably bright. As Dallas still sorts through the devastation that the fire marshal’s enforcement policy wrought on its DIY scene, and as its next generation of artists are still figuring out how to assert themselves, there is a window for Fort Worth to become the most important art scene in North Texas. Denton is contentedly self-contained (although Spiderweb Salon is changing this), yet Fort Worth has the fire, the people, the talent, and an increasing amount of institutional support to force its way into a starring role. I never thought I would say this, but perhaps we could all gain a little inspiration for how to rekindle our own art scene by looking west.